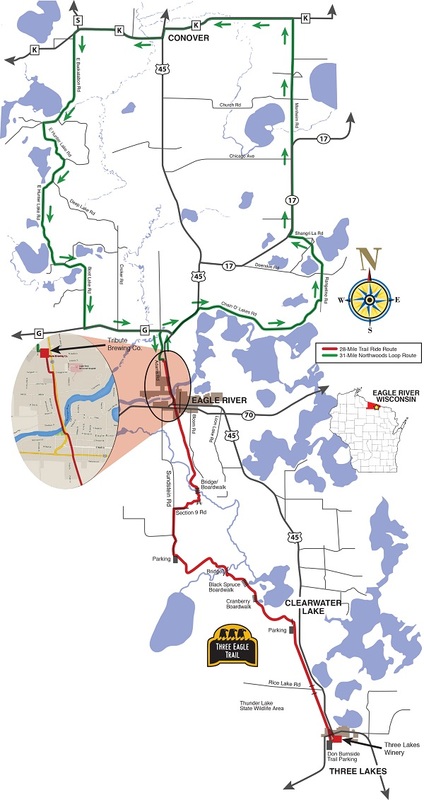 Join us on September 8, 2018 for a fun scenic ride through Eagle River to Three Lakes on the beautiful Three Eagle Trail or for a picturesque 50K loop road ride through eastern Vilas County from Eagle River towards Conover and back. These rides will both start and finish at the Tribute Brewing Company. All riders are encouraged to return to the Tribute Brewing Company at the end of the day for the brat picnic with all the fixings and many door prizes. Proceeds from this ride will support the Great Headwaters Trails Foundation in the development of bike trails for eastern Vilas County. All rides are self-guided and it is strongly suggested that each rider wear an ANSI approved helmet. 50K Road Course: The road course will take place on county roads between Eagle River and Conover. Water Station will be available in Conover near the town park. Be courteous to others. Let them know of your approach in a clear but friendly manner. Feel free to take pictures and leave the plants, animals and natural features alone. Take time to enjoy the trail/road course's natural beauty. Pick up registration information and get ready for your ride. Please feel free to take a moment to relax and get a drink of water. Three Eagle Trail will have a water stop at mile 7 and at the end of 13 miles near the Three Lakes Winery. The 50K Road Course will have a water stop at the midway point in Conover near the town park. Be sure to stop into the Three Lakes Winery and sample their wonderful wines if on the Trail Ride. Also find wine specials for participating riders. Finish your ride at the Tribute Brewing Company and sample a variety of hand-crafted beers. Lunch is served back at the Tribute Brewing Company. Joins us for a tasty brat picnic with all the fixings and many door prizes (Must be present to win door prizes). For event related questions, please use the "Contact the Organizers" button on the left side of this page. When this page loaded, the official time was 4:24:58 PM EDT.